Detailing the physical features, habits, territorial reach and other identifying qualities of the Diaphania costata. The smooth, satiny wings of Diaphania costata are edged in a golden hem that gleams in the light. A virtual twin for Kimball's Palpita Moth, Diaphania costata is also a member of the Snout-nose Moth family, Crambidae. The elongated nose has an orange burnish, sitting directly between two large round eyes that rest on either side of the narrow, white head. 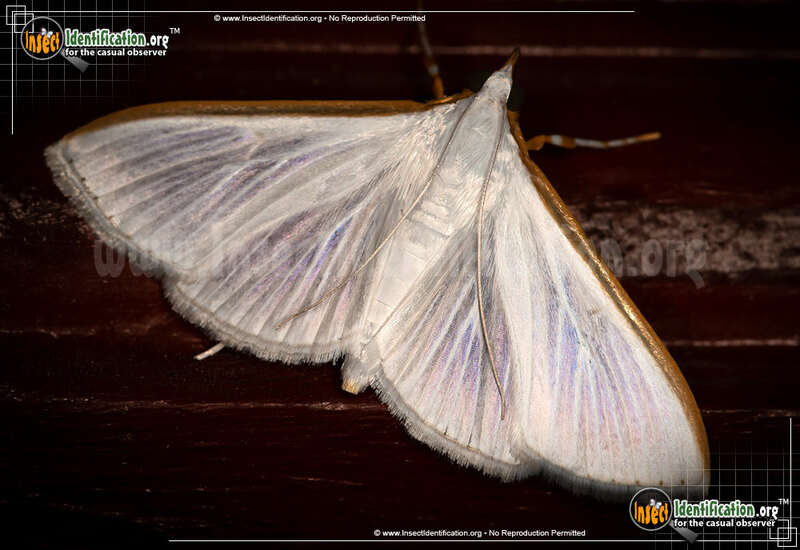 White forewings have a soft sheen and are thin enough to almost see through. They lack marks and patterns save for the thick, rounded gold front edge. This metallic line stretches from the body to the tip of the wings. The abdomen is completely white with the same satiny luster and a clean white fringe borders the bottom edges of all wings. White legs have orange color at the 'knee' joint and may or may not have orange bands on the feet. The larvae feed on plants like bluestar, star jasmine, and vinca, often ruining their ornamental appearance. Though Diaphania costata has made a home in the Deep South and surrounding states, this species is originally from more subtropical, southern countries. It seems to share a range similar to its look-a-like, Kimball's Palpita.